Unique design will attract visitors. Adjustable connectors let you change each pocket's height and angle. 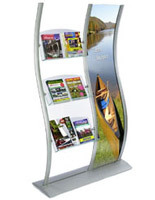 This brochure stand has an attention-grabbing, curved design to draw customers to your promotional materials. 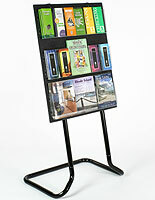 The advertising fixture, brochure stand can be used in a variety of settings to help circulate pamphlets or brochures. 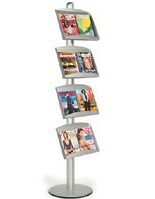 For example, this stand would greatly benefit guests in a hotel lobby or visitors in an airport terminal. 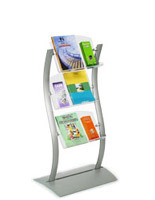 The brochure stand, also known as a literature display, has (3) holders made from a clear acrylic. Each pocket is capable of holding (2) 8-1/2" x 11" brochures, side-by-side. 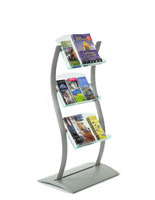 The brochure stand features (2) curved side supports, constructed from brushed aluminum and finished with a smooth silver. 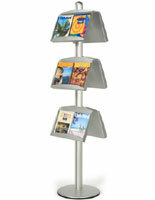 This aluminum display, brochure stand will resist rust when used indoors. 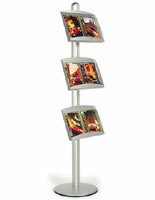 This promotional fixture is also a modifiable brochure stand. To change the height of each holder, simply slide each bracket along the channels of each side support. 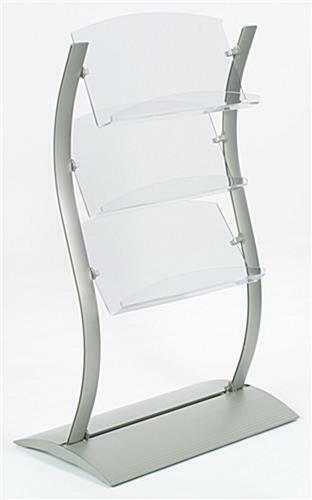 We even provide the brochure stand with moveable connectors, allowing a user to alter the angle of each pocket. Also, included with your unit is a 5-pocket literature divider for optional use. 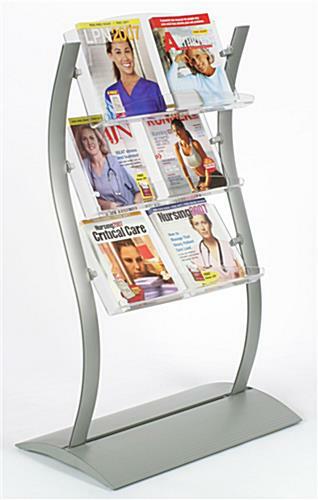 This brochure stand, such as our other wave displays, will help generate a greater interest in your pamphlets.